If a female CEO's company is in crisis, she's much more likely to be blamed for it than if a man ran the show. That's according to a new study out from the Rockefeller Foundation and the Global Strategy Group October 26 , which we first saw in the Wall Street Journal . The study looked at over 100 news stories about 20 CEOs, 11 of whom were women, and found that female CEOs were blamed as the source of the crisis in 80% of the stories, while male CEOs were only blamed 31% of the time. One of the study's biggest limitations was that it only analyzed a small group of people. But that's largely unavoidable since there are so few female CEOs. One in four Americans say they don't have any female executives at their jobs, according to data cited in the study. And when you look at the very top, the numbers sink even lower: Women hold only 4% of leadership positions in Fortune 500 companies. Previous research backs up this pattern of blame. A Federal Reserve Bank of New York study from 2015 found that female executives typically made 14% less than their male counterparts. The reason for the gender pay gap? Once again, women were more likely to be punished when their firm did poorly, and men were usually rewarded more when it did well. If a company's value increased 1%, the Fed study found, women's firm-specific wealth only increased 13%, while men's rose 44%. And if a company's value decreased 1%, men's firm-specific wealth declined 33%, but women's plummeted 63%. 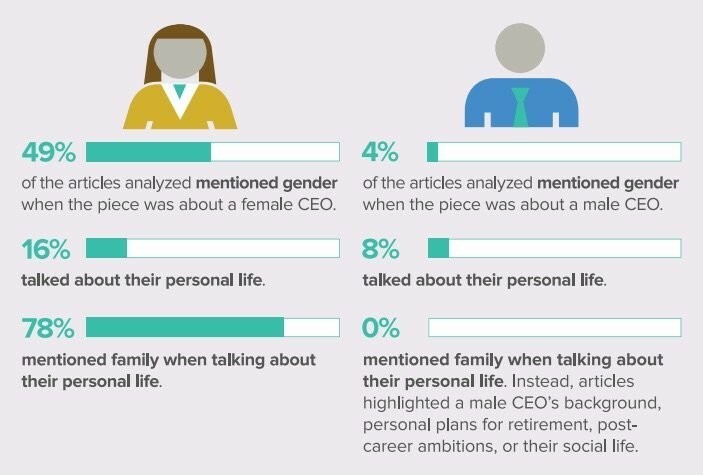 The Rockefeller study points out that journalists and public relations officers writing company press releases should be cognizant of the language they're using, because it could be different if they're writing about male vs. female CEOs. "Corporate America has a clear role to play by making significant investment to change company practices and culture to ensure more women have the opportunity to reach the highest level of management," the report writes. "Journalists have a responsibility to ensure the tone, the information they include in a story, even the order in which the information appears reflects men and women equally, rather than contributing to conventional stereotypes associated with female and male leaders."